A Timepiece, ARTpiece and FUNpiece! - Clock fills up just like Soda! Liquid sways too! Changeable Colours! - Resize clock numbers, and position them anywhere on the screen! - Different theme background takes you down memory lane – where were you when you popped your last Soda! 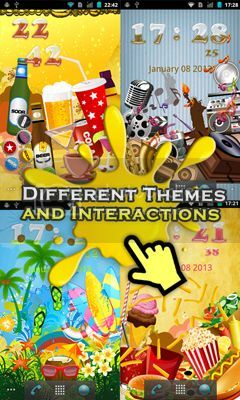 - Touch theme background to discover little surprises! You a kid? Anyways, looking cool! Thanks, Edios and navratn123, for your kind visit and comments! Hi shivam94 and herecomesmaggi, I'm glad you like it. Hoping to see more from you. Update: 5 NEW Minimalist themes for you!